The recent deployment of SBX-1, the oil derrick-sized missile radar system, is not tied to the rising tensions in North Korea, said Pentagon spokesman George Little in a briefing to reporters on Tuesday. “I believe it’s incorrect to tie the SBX at this point to what’s happening on the Korean Peninsula right now,” Little said. CNN reported Monday, the radar system left Pearl Harbor, Hawaii as part of a force increase reacting to threats from the North Korean regime. 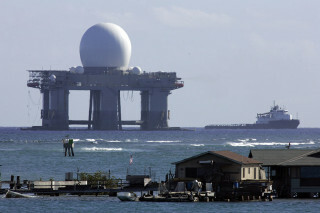 The powerful and mobile radar is part of the U.S. ballistic missile defense network. It’s designed to detect and track long-range ballistic missiles in midcourse. In the past the radar has been used to track North Korean missile and rocket tests. The U.S. has also deployed at least two, possibly three, guided missile destroyers to the region as part of the increased tensions with North Korea. USS Decatur (DDG-73) and USS John S. McCain (DDG-56), “have arrived at predetermined positions in the western Pacific, where they will be poised to respond to any missile threats to our allies or our territory,” Little said. McCain left Japan on Monday, while Decatur was en route to Naval Station San Diego, Calif. when it was recalled to its current missile patrol mission, according to press reports. USS Fitzgerald (DDG-62) is also in the region, according to press reports. All three ships are among about a dozen Arleigh Burke-class destroyers that are equipped with hardware and software to allow their Aegis Missile Systems to intercept a ballistic missile.